The other night, my family got to talking about family memories, specifically vacations on a frugal budget. While the stories were mostly memories about how my Grandma made vacations (and life) special on essentially one income to raise seven kids, I have to say that my Mom and Dad made some amazing memory magic of their own, too. You see, my dad is a pastor. Not sure if you know, but that’s not up there with the income of a doctor or lawyer…or most other folks. We had some amazing times, though, and I figured I’d share five of my favorite moments vacationing while growing up. 1. Disney World – Other than the fact that my dad was gifted a week at a parishoner’s timeshare in Orlando, I have no idea how we swung this trip. 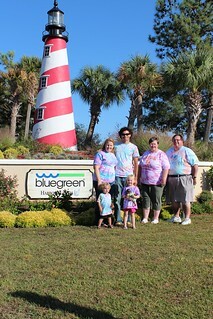 The four of us (plus Aunt Wink’s family) flew to Florida to enjoy not only Disney but also Kennedy Space Center. I remember that we packed our snacks and lunches, and returned to the condo to eat dinner at home. We visited all three parks (at the time, that was Disney World, MGM, and Epcot) on a hopper pass, and the parents split us all up to do the things we wanted to do. Dad and I went off to Epcot to feed my inner nerd in the “Worlds” (just look at me, if you can’t tell, I am on the left). Jack and Russ enjoyed fast rides, and Sally, always the ‘lil one getting left behind by the big kids, got to enjoy time on smaller rides. We even got “the hats”–mine was the Minnie head–and I still have it (and, as a frugal mom, plan on giving it to Arianna when we go next year). 2. African Safari Wildlife Park – During one (of many) conferences that my dad attended, we took a trip to Port Clinton, Ohio’s drive-thru safari. Although I don’t have a photo of this, I would be willing to bet that somewhere there’s a video of it. As a kid who loved animals, it was pretty cool to drive through an area where giraffes and zebras roamed. A bit scary, a bit crazy, but 100% fun. I look at the prices, and again, I am not sure how we did it, but we did. 3. Camping at Pymatuming Lake – My family has had lots of experiences camping, but the best has to be when my family took a weekend and (most of us) headed up to Pymatuming Lake. Uncle Matt was still alive, and he and mom spearheaded tent setup. Monica and I rode our bikes all over that park, and even taunted our (older) teenage cousin who was there with her boyfriend. Stale bread was bought, carps and ducks were fed. We rented two (what I recall rickety) plontoon boats. One was for fishers, the other for those who wanted sun. Hilarious stories were shared around the campfire. As we cleaned up the campsite, I recall lightning tearing through the park and Jack and I hitting the floor in the laundry room for fear of being struck. I vote for another family camping outing, stat. 4. Myrtle Beach – My heart belongs in Myrtle, I tell you. Since Grandma and Pappy lived there, there was no cost for staying. For the most part, my family vacationed there in December, just after Christmas. My memories are not of going to the beach to swim or enjoying the water parks or eating at one of the many restaurants there. They are of late nights playing scrabble, waking up to the smell of coffee and danishes, reading the Sun News (perhaps including articles written by my future father-in-law), playing Bingo at the Oceanside Village clubhouse, and peering in at Pappy watching sports. These trips pretty much just cost my parents gas and some food, if I were to guess. 5. Christmas Cabins – When we were not traveling to Myrtle Beach, we were renting a state park cabin the week after Christmas. Again, a simple yet memorable trip. (One stands out because Jack had just fallen down the stairs and had a black eye the entire week.) We would sled ride, play Pass the Pigs, enjoy fireside chats. There is something magical about spending Christmas in a cabin, surrounded by pines and eating holiday leftovers. These are just five of my favorite vacation memories while growing up. Now it’s your turn! Comment below — What is your favorite childhood vacation memory? This entry was posted in Becky, Camping, Memories, Our Extended Family and tagged camping, Camping Out, memories, vacationing. Bookmark the permalink. I don’t know how my mom did it every year, picking a destination and including a variety of activities that each one of us could enjoy, and on a garbage man’s and part time cashier/meat cutter/insurance saleswoman/or whatever mom happened to be doing at the time’s salary. We rented a beach house at Sandbridge Beach, VA quite often. What made it affordable was to talk another family into splitting the rental of one of the houses the farthest walk from the beach (not one of those big expensive ones with the hot tub and pool right on the ocean!) and buying groceries to cook meals at the house rather than going out to eat (our moms would work together on a menu plan well in advance and we would get everything needed for it on the first day at Food Lion). We would visit the boardwalk one night, play mini golf another, spend a lot of time floating on the waves every day, visit the aquarium, and finish the week off with dinner out at Capt. George’s Seafood Buffet (which even then, was not cheap!) I learned how to play poker there with the guys. Our parents learned the right and wrong ways to cook and eat fresh crab and shrimp bought at the gas station. I remember one year we had a big jigsaw puzzle set up on the coffee table and we all worked on it throughout the week. We weathered a few hurricanes, stayed in few duds that turned out to have silverfish and smell musty, and I remember watching the Summer Olympics there one year after I had to return from the beach thanks to a jellyfish sting. As we got older, we would buddy up and have an assigned night to plan a meal and cook for everyone. So many good memories at that beach! Those are great memories! Thank you for sharing! NicoleMcGee Sounds like so much fun. <3 beach trips. I think I appreciate my childhood vacations much more now, as an adult. I remember at the time doing a lot of complaining and sulking…but I would love to take one of those vacations now! Mostly they were road trip style, pack a lunch, etc. but all that sounds fun to me now and getting to see different parts of the country. I have never been on a vacation but, we do move a lot so I have seen lots of new places. I think our travelling has really benefited my children. Sounds like you have a lot of great vacation memories. I love going out west…Glacier National Park, any national park in Utah, Grand Canyon. Not to say I don’t enjoy Disney or the beaches on the Gulf Coast. Camping…not so much. My family didn’t have alot of money when we were growing up either but that didn’t keep us from having fun! My husband and I travel with my kids as much as we can. I often wonder what they will list as their highlights as they get older. I’m going to check out some from your list – they sound like places my kids would love. Just goes to show you… it’s the time spent together. Although we took some fabulous trips when I was a child, my favorite memories were with my brothers in the back seat of the car on the way to where we were going, or when our parents went out at night and we were doing “talent shows.” Oftentimes, it wasn’t the destination that held the memories, it was the stories around the trip! My daughter blogs with me, and I’ll have to ask her for her memories! Now I’m curious! Kim_G What a great idea! I love vacations and memories! I live within an hour of the safari wild park and have never been there, sounds like a great memory for you! Ah all of these sound like such great ideas- I especially like the lake idea. My husband is a pastor so we are always looking for frugal vacations! My favorite vacations growing up were going to Destin, FL in my teens. Now, we enjoy going to Dauphin Island, AL for a very relaxing vacation. I love family vacations! Things you have for a lifetime, no matter how long the trip. It’s great that you have such memorable ones and you’re giving them to your kids, too! (Just moved away from the Myrtle Beach area…it’s great to visit but living in, so different!) Have a great day! Our family just returned from a week in Disney World. Our older kids live on the West Coast and we on the East. We all met up in Florida. It was such a wonderful family time. I’d have to say that the most enjoyable times were when we were eating or standing in line, ‘cuz that’s when we could actually talk. 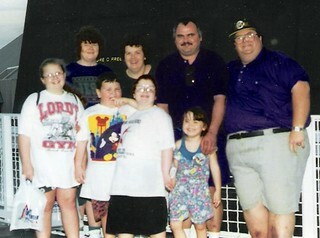 Some of my favorite family trips were when we went to family church camp in the summer time. Great memories! I would love to go to Disney World or Myrtle Beach. Can you believe I’ve never been to both? My grandma also has never been to Disney World and I would love to take her there some day soon. Perhaps my favorite childhood vacation memory is going to Six Flags– I love the rides! We would go camping on a beach some place in Texas. One year we went and this big, mean rain storm came on shore and we left the beach to stay at a holiday Inn. That year our truck was stolen out of the parking lot with all of our camping gear in it. I remember my dad coming back into the hotel room and asking my mom “ Where did I park the Truck… because its not where I left it.” Ever since then its been a running joke in the family if you can’t find your car in the parking lot. What beautiful memories! I hope I’m creating these for my kids right now. What a great way to remember those trips! My parents took our family on some great trips when we were kids too which included some of the places you mentioned (Disney and Myrtle Beach) I am from SC so yes I totally get you when you say your heart belongs there. I love Isle of Palms too (in Charleston). I used to go RV camping with my grandparents. We would play games, bingo, and mini golf. I was a bit spoiled with the RV camping- don’t like regular camping. It’s wonderful to have memories like that and I’m making them with my kids now! Growing up, my mom was a single parent and we lived with my grandparents. We didn’t have much money, so the “vacations” we took were always to visit relatives. I was in junior high school when I got to actually go away to the shore for a week with my friend and her family. To say that I’ve made up for it as an adult is an understatement! I was 44 when my husband and I took our first trip (he’d never been there either) to Disney World. What a great experience! I’m not even sure I would have enjoyed it as much as a kid. But Myrtle Beach is still on my “must do” list. Maybe next year! I have a few childhood favorite vacation memories. I guess the one that stands out the most was when we went to the Black Hills back in 1965. We had a wonderful time and it was the first time we had a “big family vacation.” Mt Rushmore really stands out. This is a great post. Some of my favorite memories are the family car trips my family took with my grandma. We saw Gettysburg, Willamsburg and everything in between. It was amazing. thanks for refreshing those memories. Oohhh I think we may have to check out the safari. My daughter loves animals and this would be a perfect vacation for her. Thanks for sharing. Christmas cabins are just the best especially if you get to spend them with your friends and loved ones! Staying there with your family is priceless! I’d have to go with my trip to Magic MOuntain when I was little. It was road trip and my family took it with my Aunt and Uncle. We had a trailer and everything! That was a fun time. Great post idea. Those sounds like great vacations. My favorite one was when we took my Mom, sister-in-law, her 3 kids and my two kids to go see “the President’s faces”. We had a great time even though our car broke down on a reservation. We were all crowded into a car but had a blast. Great vacations! I think my favorite vacation as a kid was our family reunion in Winter Park, UT. We didn’t do anything elaborate but we had so much fun spending time in the great outdoors. My favorite childhood vacation memory is our trip to New York! We got to go to a Broadway show and all of the museums while also hanging out as a family!